The Scottish FA and Scottish Professional Football League should unite as one governing body, says Ross County chairman Roy MacGregor. The Sunday Mail newspaper has launched a campaign backing such a move. And MacGregor told BBC Scotland: "We've got a league system and we've got a governance system. "There's less duplication than in the past, but I do think it's still there and I think both organisations can live within one structure." 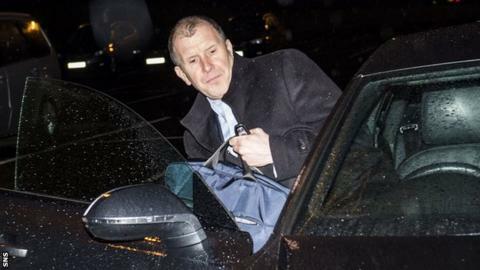 The calls come after Stewart Regan resigned last week as SFA chief executive following the failure to persuade Michael O'Neill to switch from Northern Ireland to succeed Gordon Strachan as national head coach. With the SFA now without a chief executive and team boss, businessman MacGregor thinks it is an opportunity for the SFA to review a system that does not allow its top officials sufficient autonomy to make decisions. "It's football, it's a crazy game and we don't do things they do in normal businesses," he said. "But, with disappointment, there are great opportunities and it is an opportunity to actually have a look at the way things are done and look at the way the set-up is, look at the way appointments are made, look at trying go get something fresh, something new. "There are challenges with the SFA with the structures there and normally the chief executive would have a bigger say along with the chairman in how a business was run and maybe it's time to have a look at it. "It is stupid that we have two commercial teams selling both organisations and there will be other areas of duplication. "So I think it is a chance to begin to look with open eyes at whether change - and radical change - is actually needed. "I do think governance and entrepreneurship can live side by side and I would encourage the people at the top to look at that." Hibernian chief executive Leanne Dempster has received backing from some within Scottish football to succeed Regan. "People like Leanne have been mentioned and she would be absolutely terrific - she's fresh, she speaks her mind, she's been in a business and someone like that as a chief executive would be absolutely wonderful," MacGregor said. "Let's hope the people at the SFA are imaginative." MacGregor expressed sympathy for Regan, who had been in post for eight years. "In all my dealings with Stewart, I found him really good," the County chairman added. "He's had a difficult job because he's working in a system that's very committee driven and, even at the time we were appointing a manager, to have to wait so long to get people to agree the job description and salary seems absolutely crazy in the business world."